A Broadway show which was based on the hit reality TV programme American Idol has closed after its first official night on stage in New York. Idol: The Musical, which was dubbed a "satirical musical comedy", was originally previewed in July. By the end of the month the entire cast had been replaced without explanation and fresh previews began on 1 August. Producer Todd Ellis said he had scrapped the show "due to a lack of advance ticket sales". He added that a "lack of positive feedback from audience members and critics and a lack of sustainable financial resources" had also fuelled his decision to close the show. Earlier this month, American Idol judge Simon Cowell announced he was going to make a movie set behind the scenes of a TV talent show. The film, currently titled Star Struck, will tell the fictional story of 10 contestants in a singing competition. 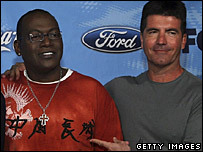 Cowell will help pick the lead characters from open auditions like those used on American Idol. In May, 17-year-old Jordin Sparks became the youngest ever winner of the show.